Much of a breastfeeding mother’s diet transfers into her breast milk and to her babies. While many babies can handle what mom eats just fine, others may become fussy when certain foods pass through the breast milk. In addition to wheat and eggs, dairy products are a common culprit. There are varying degrees of milk allergies, making it difficult to know just how much dairy you should eliminate from your diet. Milk protein allergies are not common in babies. Nursing mothers often look to their diet as the culprit when their babies become fussy for no apparent reason. However, only a small percentage of babies have true food allergies. While cow’s milk proteins are the most common type of food allergies in breastfed babies, Kelly Bonyata, a lactation consultant, says that food sensitivity in breastfed babies is much less common than many moms are led to believe. Bonyata suggests looking for these signs to determine whether or not food is causing your baby’s behavior: fussiness primarily after feedings, eczema and diarrhea. To check whether or not your baby is sensitive to dairy products, chart what you eat and keep track of your baby’s periods of fussiness. If you notice regular patterns, try an elimination diet in which you stop eating this type of food. If your baby’s symptoms seem to improve and nothing else has changed, you may have a baby with food sensitivities or an allergy. Bonyata suggests waiting for two or three weeks before making your final assessment, since it can take this long for milk proteins to leave your system. After several months, slowly phase dairy products back in, depending on the degree of your baby’s food sensitivities. 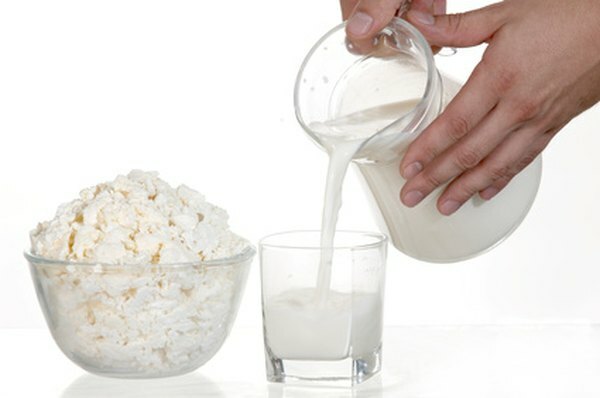 Milk protein is not only found in milk. It is in all dairy products. These include not only yogurt and cheese but also products like cottage cheese and sour cream. Which foods you cut depends largely on the degree of your baby’s food sensitivities. If your baby is highly allergic or highly sensitive, you may have to eliminate all dairy products from your diet. This includes not only what you might find in the dairy section of your grocery store but also traces of dairy that are often found in processed foods. Mothers whose babies are only mildly sensitive may be able to eat a little dairy from time to time. The type of dairy generally doesn’t matter; it’s more about the amount. When you re-introduce dairy into your diet, monitor your baby’s reactions to ensure that his symptoms do not return. All dairy is pretty much created equal when it comes to food allergies in breastfed babies. But Bonyata says that babies are not reacting to the lactose in dairy but to the milk proteins. In addition, many babies who are truly allergic to milk proteins also have reactions with soy products, making soy milk a no-go for many breastfeeding moms. If you think you may need to cut dairy out of your diet, talk to your child’s pediatrician for advice.